A classic mind training (lo-jong) text by Kadampa Geshe Langri Tangpa. This mind training (lo-jong) root text was composed by Kadampa Geshe Langri Tangpa (1054–1123). 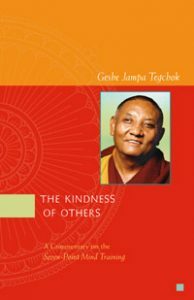 The verses were translated by Lama Thubten Zopa Rinpoche at Kopan Monastery, 1980, and lightly edited by Ven.Constance Miller, 1997. See also The Everflowing Nectar of Bodhicitta, a practice by Lama Zopa Rinpoche that combines the eight verses with the Thousand-arm Chenrezig practice, and his commentary on The Everflowing Nectar of Bodhicitta, which can be found on the Lama Yeshe Wisdom Archive website. 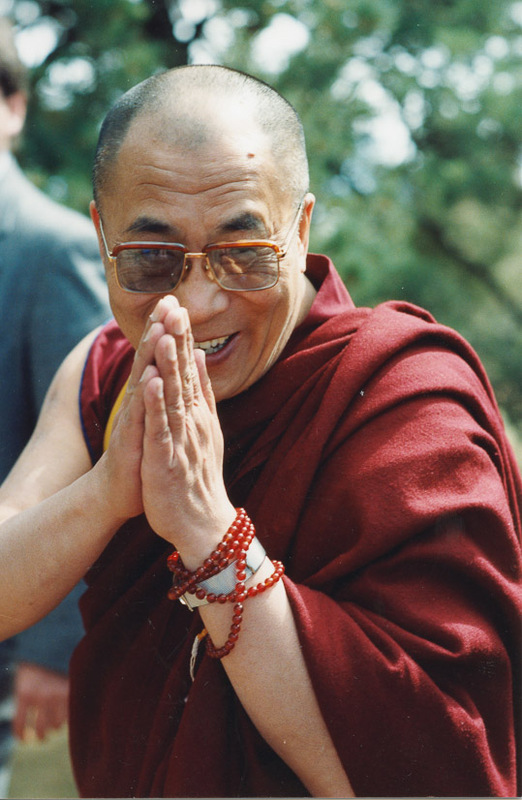 Also refer to the Commentary on the Eight Verses of Thought Transformation by His Holiness the Dalai Lama, also on the Lama Yeshe Wisdom Archive website. Next are the eighteen samayas, or commitments, of mind training, which teach us to act in ways that are consistent with the mind training instructions. We should change our mind from selfishness to altruism but at the same time avoid any external display of having done so. Rather than trying to create the impression that we have changed—like making our eyes look very compassionate to make people think that’s how we are— we should just behave normally. When somebody has a fault we should not broadcast it to everybody. We should not be preoccupied with investigating other people’s faults as this is not our business. We should deal with our most evident—that is, most powerful—delusion first. When we work for the benefit of others it should truly be in order to attain enlightenment for their sake rather than our own. We should not practice mind training just to overcome spirits and so forth or to compete with others in realizations, which would merely perpetuate our delusions instead of destroying them by means of the antidote. We should not harbor a grudge against somebody who has harmed us in some way by nurturing a grudge and waiting to get revenge. This is similar to the twelfth commitment. We should not interfere when others are trying to achieve a virtuous goal or prevent them from doing something positive. We should not lie in wait for an opportunity to get revenge on somebody who has harmed us. We should not undermine people in public or recite mantras to overcome spirits, gods and so forth. We should not try to cover up our own mistakes by making out that they are somebody else’s, blaming others for errors that are actually our own. When working with other people, for example, collaborating on a project, we should not take all the credit, suggesting that although the others helped a bit, we ourselves did most of the work. We should not use mind training simply to overcome those harming us, for example, spirits, or to benefit just our family and friends. If through the mind training practice we become tricky, deceitful or proud, these are examples of turning a god into a devil. A god is supposed to be good but we turn it into a devil; we turn something good into something bad. We should not do this. We should not give others a hard time or cause them to suffer just to find happiness for ourselves. We should not hope to gain happiness through the suffering of others in any way. So far we have looked at the source of this instruction and its qualities. This section shows how the teacher should lead students through the instruction. Because the text explains the practice in seven sections, it is called the Seven-Point Mind Training. 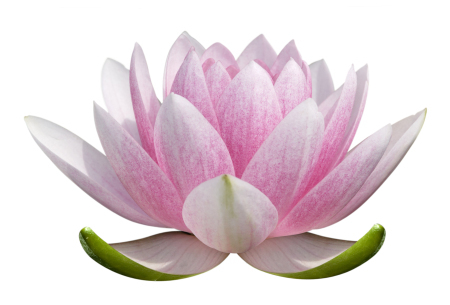 (c) refuge and karma—the explanation of karma and its results is the advice we should follow after going for refuge. (d) meditating on the faults and sufferings of cyclic existence. 8For detailed teachings on all three scopes see, for example, The Great Treatise on the Stages of the Path to Enlightenment and Liberation in the Palm of Your Hand. 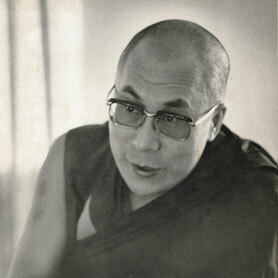 A commentary given by His Holiness the Dalai Lama on the text written by Kadampa Geshe Langri Tangpa in Dharamsala, India, 1981. 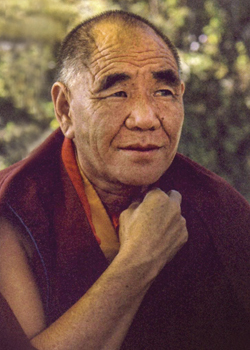 A teaching on the Seven-Point Mind Training by Geshe Lama Konchog at Atisha Centre, Bendigo, Australia, from October 31 to November 3, 1987. A commentary on the root text The Seven-Point Mind Training given by Geshe Lama Konchog at Atisha Centre, Bendigo, Australia, from October 31 to November 3, 1987. Translated by Dhawa Dundrup. Transcribed and edited by Ven. 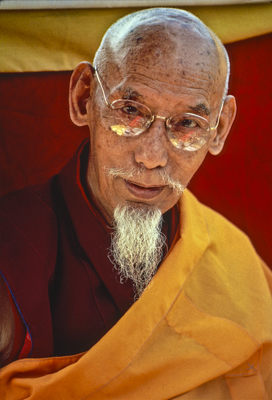 Thupten Konchog, who accepts all errors and omissions. Second edit by Sandra Smith, January 2013. Lama Tsongkhapa said, in Songs of Experience, that to have attained a human body is a very rare experience and it should be used to its maximum potential for the Dharma. This human body has great potential if used positively but also great power if used negatively. We can illustrate the great potential of human rebirth by putting all the animals of this universe on one side and a single human on the other; even the combined number of the other sentient beings cannot equal the potential and ability that one human has to do positive actions. Let us imagine a magical machine that has the power to produce anything a person could desire. If such a machine is used to produce only straw instead of using it to produce many wonderful things, we can understand how stupid that would be. Likewise, our human body is just like a magical machine and if we use it in a trivial way then we, too, must be considered to be very stupid. There is not a more ignorant person than the one who possesses a human body yet does not put it to proper use. If we use this human body in a negative way, it has the potential to be very destructive, but used in a proper and positive way, it has the power to generate bodhicitta and the mind of enlightenment. When it is used meaningfully, this body can help us attain realizations on all the various levels of the path. In the past, many great masters from India and Tibet used their human bodies to reach the desired goal of enlightenment. If we do the same, we can be just like them and have the same kinds of achievements and accomplishments. Our normal attitude to life is such that the possibility of achieving material gain is far more important than putting our human body to proper use. This attitude is due to not realizing the importance of this precious human body. Maybe some people do realize its importance, yet they are still tempted by the prospect of material gain. These people feel more strongly about acquiring material possessions than they do about directing their mind towards a spiritual path. We might feel that spiritual practice is beyond us, but if we think and examine this carefully we will realize that spiritual practice is very easy. It is as easy as changing and transforming our mind and attitude; there is nothing to transform externally. If we stop doing something bad that we have been doing for a long time and substitute it with a positive attitude, along with good actions, that is spiritual practice. Spiritual practice only depends on the transformation of the mind; it is easy. Our present way of thinking is to regard this life’s interests and welfare as far more important than the next life, so we use this body to accomplish the good things of this life only. What we have to do is completely turn this attitude around and instead, be more interested in the next life’s welfare and employ this body to do the things that will bear fruit in the next and following rebirths. We can make a boundary line to decide whether we are acting for this life’s interests or the next, by deciding whether our actions are Dharma-based—whether they are spiritual or non-spiritual actions. We usually use our body, speech and mind for this life’s interests only and in doing so we use them in ways that are harmful and not helpful to other sentient beings. So what we must do is change or transform our actions of body, speech and mind so that we help others and do not cause them harm. We also need to be very aware of the next life. From this point of view we can understand that spiritual practice is not something difficult or too distant. If we put all our efforts into spiritual practice, we can attain the best possible result in the next rebirth and even if not, we can still attain an intermediate result. Even if we can’t attain that, we can attain the lowest result to be achieved by spiritual practice. So there are lots of options which we can choose, in accordance to our abilities and mentalities. It is only a matter of putting in the effort to do so. In the past we have attained many human rebirths, yet in all those lives as a human we did not use our body for proper spiritual practice or in a proper way, because we were not able to achieve the results of having higher realizations. Now, if we do not use our rebirth properly, the pattern will continue. Even up to this present moment, we have spent most of our time pursuing things totally related to this life only. If we consider our present life carefully, we would see that we have spent much of our time doing things that can bring no profit for future rebirths. We have had many rebirths as different aspects of sentient beings, from the top of cyclic existence to the lowest. We just do not remember them. Actually there is no form of sentient being that we have not taken in the past. This pattern will continue if we do not carry out our spiritual practice, and our past will continue to be our future. We have been born into many different forms and experienced many different forms of suffering; if we were to remember them we would find it unbearable. However the past is the past; it is over, but what we have to do for the remaining part of this life, is to put effort into spiritual practice for the next life. At best, we should be able to achieve enlightenment and at the intermediate level, we should be able to attain individual liberation. If we cannot attain these two levels, then the remaining part of our life should be spent doing spiritual practices, so at least we will avoid future migration into the three bad migrations—as a hell being, a hungry ghost or an animal. If we know that we will have this human body for a very long time, there will be plenty of time to do spiritual practices, but we do not know this and it is a very bad mistake to think like this. It is also wrong to think that we can put it off until the next rebirth, because it is not easy to obtain a human rebirth as it requires all the proper causes and conditions. What we have to realize is that this is the time we have the freedom to decide: “Am I going up to a good migration or down to a bad one?” It is up to each one of us to use this body to its maximum potential for the purpose of next life. To take rebirth as a human is not at all easy. Rebirth is not a product without causes or conditions; it all depends on causes and conditions and they do not occur easily. First we have to observe the morality and discipline of observing virtuous conduct and we have to practice the six perfections together with pure aspirational prayers. If all these factors are complete, then the next rebirth as a human is possible, otherwise it is not. The human body as a basis for spiritual practice depends on being able to do the practice. We may be rich with material possessions, but if we have not used our body for proper spiritual practice, then in the real sense we are not rich. However, a person with no material wealth who has used his body for spiritual practice is in the real sense of the word a rich person. We may think, “I will use this body for spiritual practice, but first I must have all the material facilities, so I must work, earn some money and look after my family and then I will be able to do my practice.” That kind of procrastinating attitude deludes us. If the older students are asked, they would have to admit that most of their time is spent in worldly activities and very little in Dharma practice. Even for any of the older students to have done pure spiritual practice is quite doubtful. Our normal attitude is such that we go on procrastinating. We think, “I will do it tomorrow, tomorrow.” We never think, “I may die today!” So we just go on and on, putting it off from day to day. If death comes today we have achieved nothing, so we must be very intelligent and clever, and practice this very moment. People who do not procrastinate, do their spiritual practice with a decisive attitude. Even though they realize that they may die today, there is no regret because they are doing the practice right now. Such a person is an intelligent person. The human body has great potential, but death can come at the most unexpected time, for instance by a car accident or a deadly disease. For some people, when the sickness is very serious and life-threatening, the teacher or lama can only give instructions such as thought transformation, as nothing else may be of help. The only thing that we can take with us to the next rebirth is our spiritual practice, the Dharma. It is the only thing that will bring happiness and success in the next rebirth. We all want happiness and we do not want suffering, and even if we die today, spiritual practice is important because we can make aspirational prayers in order to have a good rebirth, which is the basis for the attainment of enlightenment. If we have done generous and charitable acts during our lifetime, then there will be no shortage of possessions in the next rebirth. In this life we may have many facilities, but if we have not done spiritual practice then in the next life they will be absent. Spiritual practice is really a preparation for happiness in the next life, so it is very important. We want happiness and we do not want to suffer—that is the innermost desire within everyone of us and because of this, spiritual practice is so important. A person who is mindful of death feels afraid now, but does not fear death when he is dying. This person is an intelligent person. However, a person who is not afraid of death at present, but is very frightened when death actually comes, is a foolish person. Milarepa sang a song which says, in effect, “I am afraid of death because I am not mindful of it, so I have gone to the mountain retreat to understand the relative nature of the mind. Because of this, for the time being, I seem to have no fear of death”. We need to be very mindful of the death process and make preparation for it, so that when the time comes we will feel no fear. At the time of death, our mind will not dissolve into nothingness as the external substances of the body do. The mind is not like that. It is and always has been, a stream of continuity. The subtlest mind, which is inseparable from the subtlest wind, goes on from one rebirth to the next. There comes a time when this subtlest mind, in combination with other causes or other gross minds, becomes more in amount and engages in more activity. However, at the time of death it loses its composite parts and becomes the subtlest mind and wind, and goes to the next rebirth. We have to understand the nature of the subtlest mind and wind, and once we have attained the realization and understood it completely and properly, there will be no more fear—just like Milarepa, who discovered he had no more fear when he understood the reality of the mind. We have to understand the nature of the subtlest mind, which is known in Tibetan as “the remote mind.” This is like, for example, a person in total solitude in a mountain retreat. That person is said to be abiding in remoteness. So like that, if our most subtle mind remains too deeply inside, it is only the coarse mind that is performing activities. What we understand is only the external coarse mind and not the innermost subtle mind. Scientists doing studies on the function of the mind only find the external, coarse mind. If we could find the innermost mind by research, then we would not have to experience any more suffering of samsara, cyclic existence. We all possess this innermost, subtle mind, which is the seed, the very potential, for the attainment of enlightenment. At present we have not been able to find or understand the most subtle mind, so we have not been able to employ it properly. This is why we have not attained enlightenment and have been wandering about in cyclic existence. Once we have discovered the most subtle mind, it is called by the term “the knowing wisdom.” At present our minds are ignorant, which means in Tibetan “not knowing,” so what we have to do is to find that most subtle mind and use it properly. Our mind-stream has much more negativity than virtue, so there is naturally a greater possibility that our next rebirth will be in one of the three bad migrations. There is far less possibility that we will attain a higher rebirth such as a human or a god. After death, rebirth is determined by either of two ways. The first is by the heaviness or lightness of the negativities or the merit on our mind-stream; and the other is by determining which of these we have become more accustomed to. If we have met with a Dharma teacher and done good spiritual practices, we naturally become more accustomed to performing virtuous deeds and thereby accumulating more merit. So naturally when death comes, if we have become more familiar with doing virtuous acts than non-virtue, we will definitely have a good rebirth. If we have become more familiarized with doing virtuous deeds we will have accumulated merit, so in the next rebirth we will enter the formless or form realm. This means our rebirth will be as a human or as a god. If we have done many non-virtuous acts, then the next rebirth will be any of the three bad migrations, such as a hell-being, a hungry ghost or an animal. We have developed great power in collecting negativities onto our mind-stream, which becomes the cause of going down to the three bad migrations. We are like a super-power in collecting negativities, but like an underdeveloped country in collecting virtue. We can see which rebirth we will be taking just by looking at our actions now—negative or positive, virtuous or non-virtuous. If we have done more non-virtuous actions than positive, then it is likely to be a bad rebirth. If we are reborn in a hot hell realm, the body will become inseparable from the very nature of the flames, or fire. In hot weather here in Australia, we feel uncomfortable and turn on our air conditioners, but in the hot hells our body becomes fused with the fire and is unbearably hot. If we are born as a cold hell being, then our body becomes inseparable from the coldness of the ice and once again there is no relief. But at the present time if the weather becomes cool, when we find it unbearable we turn on our heaters. When we do the fasting practice, the nyung-nä, we do it only for the required amount of time, but if we were born as a sentient being in the hungry ghost realm, then for aeons we would have to stay without food in a constant state of starvation. If we were born as a sentient being in any of those bad migrations we would understand just how bad it is there and we would seek refuge. Just as a criminal turns to a solicitor to defend him, we too, would have to turn to the kind of refuge we could rely on for support. A criminal must depend on a solicitor for the entire length of time that all charges are made against him. Likewise, we have much negativity created from beginningless lifetimes and so we have to depend for protection on refuge in the Three Jewels. This has to be continuous and for a very long duration. Before death comes we should at least have generated the attitude of going for refuge and observing the law of cause and effect. If we can generate a feeling of fear towards the suffering of the bad migrations and so generate an attitude of wanting to go for refuge to the Three Jewels as well as observing the laws of cause and effect, then definitely in the next life we will obtain rebirth as a human. However, a practice done only with this much motivation is merely a spiritual practice, without pure motivation, because to be reborn again as a human being is not a permanent release from suffering. So if a person has not done any spiritual practice, they will still continue with those sufferings. This body is called the aggregates of the contaminated mind, which means that it is the result of negative actions. This human body which has been attained is the result of non-virtuous actions. This is called in itself, cyclic existence. No matter what kind of body we have, as long as there is suffering, that body is called the contaminated result of non-virtuous actions. The aryas, the ones who have attained realizations on the path of seeing, have eliminated the cause for suffering, the ego-grasping, so they no longer suffer experience cyclic existence. However, as long as we have ego-grasping, there will be this suffering body. Of course, the wisdom realizing emptiness is the only means to uproot the cause of suffering, the ego-grasping. We can do visualizations, aspirational prayers, the practice of Chenrezig the Buddha of Compassion, as well as other practices and we can be reborn in one of the pure realms. Once we are reborn there, we are still ordinary people of course, but because we are doing practices and receiving teachings, from there we can gain enlightenment. If we do the nyung-nä fasting practice along with very pure mantra recitation, as well as aspirational prayers to the deity, we will be reborn in one of the pure realms. So from this point of view, we can understand the very great potential of this human body. If we decide to do a spiritual practice there are many options and alternatives available to us. There are practices that will bring us rebirth into any of the pure realms. It is only a matter of choosing to practice or not. It is just like going to a very big shopping centre where we can choose from the many different products being offered. If we want to eliminate the causes of suffering during this lifetime, we must attain the wisdom realizing emptiness and for this purpose, for the time being, we have to abide on the three higher trainings. These are the trainings in morality or discipline, in concentration and in wisdom. If we practice these higher trainings, we can, at least, be freed from the three lowest realms of cyclic existence. When we attain liberation, we are freed from cyclic existence, but that is not enough because there is still self-interest there. It is a completely selfish attitude to be only interested in our own attainment of the goal, because there are still mother sentient beings who suffer. To be freed from cyclic existence is not the ultimate attainment, because we have still not attained all the qualities and overcome all the weaknesses. The attitude we must generate is one of great courage. We have to think, “I will release all these sentient beings from suffering. With this purpose in mind, I will first have to attain the state that has all the qualities and is completely without any evils or weaknesses.” In other words, we must attain buddhahood. The word for buddhahood in Tibetan means being awakened from the sleep of ignorance and having all the qualities developed. This is the state we must attain in order to help all sentient beings. In order to do the practice so that we will attain the state of buddhahood, first we must understand the practice. To understand the practice, we must first listen to the teachings, and so it is with this attitude and understanding that we must now generate the motivation for listening to the teachings. The practice to attain buddhahood—completely attaining the qualities without any negativities—is a very profound subject. It is called the Seven-Point Mind Training practice. This is a most profound teaching and in a sense it is the innermost essence of the teaching of the Great Vehicle, the Mahayana path. It is the practice that we must consider as the most important in order to attain the highest form of enlightenment. There is no greater or meaningful practice than this one. 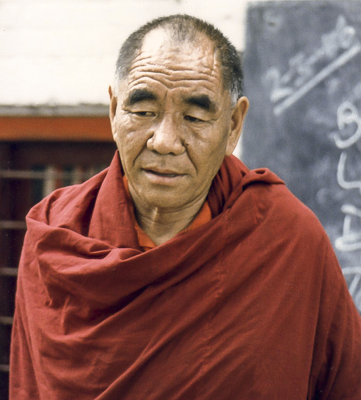 This Seven-Point Mind Training text was written down by Geshe Chekawa, but it was not something that he invented, nor is it new. The subject was taught by Buddha along with all the practices of mind training, but no matter what subject headings and subdivisions there are, they are all included in the Seven-Point Mind Training practice by Geshe Chekawa. The source of this text originated with the Buddha and most especially when he generated bodhicitta in the hell realm while pulling a chariot along with other sentient beings. The source also lies with the text by Nagarjuna called The Precious Garland and the great Shantideva’s Engaging in the Deeds of the Bodhisattva (Bodhicaryavatara). 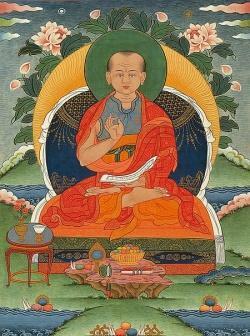 At the beginning of the text, Geshe Chekawa pays homage to Avalokiteshvara, the Buddha of Compassion, by saying, “I prostrate to Avalokiteshvara.” This has a special significance because it ensured that his work of compiling the text would be successful and be without any hindrances. It seems that respect is paid explicitly to Avalokiteshvara, the Buddha of Compassion, but it also implies that respect is paid to the compassion that is within all sentient beings, because this was the actual source that the Buddha of Compassion arose from. All the qualities of the Mahayana path have great compassion as their source either in the beginning, the middle or at the end. In the beginning, great compassion is like the seed being planted in the soil; in the middle, the seed is nourished with water, sunlight and caring which is like the cause for continuous practice; and at the end it is like the ripening of the crop so that we can eat and live. If there are no continuous conditions such as teachings and discourses, there can be no result, therefore all the qualities of the Mahayana path lie in the beginning, the middle and the end. The teaching was passed from Shakyamuni Buddha to Atisha, who passed it to Dromtönpa under a seal of secrecy. Dromtönpa passed it to Potowa and others in secret. Geshe Sharawa passed it to his disciple Chekawa, who gave the teachings to the public. This teaching has its origins in the great compassion or bodhicitta of the Buddha when during one of his rebirths as an ordinary sentient being suffering in a hell realm, he saw others trying to pull a very heavy chariot. Through his great compassion, he understood that the ego-grasping mind was something negative, whereas caring for others was something positive. This became the basis of the Seven-Point Mind Training practice. With this attitude in mind, he helped the other people pull the cart. The agent of the hell realm crushed a very heavy hammer down on the head of Buddha and said, “Why are you taking onto yourself the burden of others? You do not need to do that!” From then on the Buddha took rebirth into a higher aspect. So it is that this teaching, with its emphasis on the great compassion, originated from the very first act of Buddha at that time. This teaching also has a deed of the Buddha in the middle. Once he was born as a boy, but each boy born to that mother died, so it was believed that he should be given a girl’s name. So this Buddha was named Zaway Pumo. Zaway Pumo sold things in the market place and gave the money to his mother. However, one day he wanted to go with other merchants to trade in faraway countries, but his mother insisted that he didn’t go as it would be too dangerous. He decided to go, so he walked over his mother’s body and was out of control. This boy went on a sea voyage and passed the coasts of four different islands or countries, each with a different name. The first place was called “the country of joy.” He met four or five different girls there, but still he moved on to the next place. The next place was called “the supreme joy.” He continued on to all these wonderful islands in this way and it was believed that this journey was the result of the boy giving his earnings to his mother. So a very good result ripened from this action and he was able to enjoy the benefits of those countries. Finally he came to a country where there was a house and inside there were many people who were suffering very badly. An iron rod circulated over the heads of the people like a fan and as it went around it kept cutting and smashing their heads. The boy saw this and it caused him great distress. When he asked these people why they were experiencing such strange suffering, they replied that it was because they had stepped over their mother’s head in the past. This was considered to be a very disrespectful act. Suddenly a voice sang from somewhere in the sky, saying that the rod that had been circulating over the heads of these people would now stop and the people did not have to suffer any more. But now the iron rods would circulate over the head of the boy instead. This was the result of the ripening of the act where the boy had walked over his mother’s head in the past. While the boy was experiencing the great suffering of the iron bar over his head, he began to consider the self-cherishing and ego-grasping mind and so it was at this point that he generated the attitude of caring for other sentient beings more than for himself. He thought about the unbearable suffering of those who had committed similar acts towards their mothers and how they would have to experience similar suffering. With this reasoning he thought, “May the result of sentient beings of the past, present and future who may have stepped over their mother’s body ripen upon me.” Because he generated this attitude so powerfully, the iron rod that had been circling over his head immediately went away. If we experience problems with sickness or other similar desperate situations, it is good to think about this incident of the Buddha during one of his past lifetimes when he had a girl’s name. Instead of being depressed, we can generate an attitude of courage—that this sickness can be substituted for the sufferings of other sentient beings. So whenever we experience physical or mental suffering, no matter what the problem, instead of being depressed, generate a good heart towards taking on the responsibility for others. This can be very effective. This method is a very profound instruction; it is very effective in removing suffering. The spiritual practice of the Great Vehicle, the Mahayana, is something that has to be accumulated bit by bit, atom by atom. It does not come upon us suddenly and at a certain time. The process is not like that, it has to be achieved bit by bit.